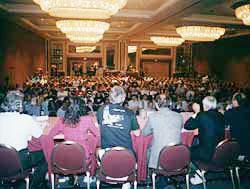 Dr. Joanne, along with panel members Dr. Timothy Leary, Joe Haldeman, Milton Wolf, and David Brin, address a standing room only crowd on Intimate Technology at the World Science Fiction Convention in Chicago. Dr. Joanne Pransky’s path involved a great deal of observation and insight into the human condition, surprisingly enough. In the ‘80s, after selling computers to small businesses, she noted the resistance many intelligent people had to technology, even when it made their lives easier. She also knew, however, that one day the PC that sat on executives’ desks (often unused), would one day, with the physical addition of arms and legs, become a familiar and accepted form of our future robot assistants through service robotics. It didn’t take a long leap for Joanne to make the move toward acting as a Robotics Industry Ambassador– someone who could act as the conduit between humans and robots, paving what she knew was the inexorable road toward a world that included robots in our daily life. This also meant helping robotic developers navigate these complex issues, as well as facilitating adoption by a (sometimes) wary public. A qualified robotics speaker and consultant does many things – informs people who are less familiar with robotics, relays information about the benefits, and entertains. This is where robot specialist Dr. Joanne Pransky comes in. Named by Isaac Asimov himself as “the real Susan Calvin” in the late ‘80s, Joanne is the World’s First Robotic Psychiatrist®, and a professional robotics expert and speaker who has lectured nationally and internationally on issues concerning the human-robot relationship. She’s appeared on The Tonight Show with Jay Leno, CNN, Comedy Central Sports Presents BattleBots, the SyFy Channel (back when it was still the “Sci-Fi Channel”), and more. Joanne relishes the opportunity to act as a robotics speaker and introduce our electro-mechanical companions into the world where they can better learn to interact with us. 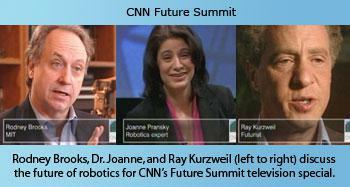 For more information or to book Dr. Joanne Pransky as a robotics speaker for your next event, please contact her now.